Pearl Moreno left her family on March 4, 2012. She was a lifelong resident of Stockton for the past 84 years. She passed away at St. Joseph Medical Center at the young age of 91. Pearl knew how to live her life and focus on what mattered most: warm kitchen, delight the appetite and warm the heart with family love. She is survived by her three children, Sandy Giovannoni (Alan), Jeffery Moreno (Judy), and Greg Moreno (Marci), whom she had with her late husband, Frank Moreno. Pearl had many roles in her life as Daughter, Sister, Aunt, Wife, Mother, Grandmother and Great Grandmother. 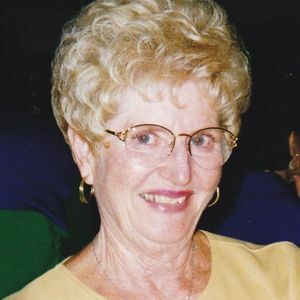 She was proud grandmother to 6 grandchildren: Bob Giovannoni (Jolene), Lori (Bart) Greim, Cortney (Jon) Monroe, Allison Moreno, Kyle and Bryce Moreno and great grandmother to 4 great grandchildren, Stefan Giovannoni, Daniel Greim, Jovanni Giovannoni and Brandon Greim. She was preceded in death by her late husband, Frank Moreno, Parents, Anna and Charles Nunes, and brothers Charles (Red), Elmer, Robert and Pete and sister Henrietta. She also leaves behind many beloved nieces and nephews. The family wants to thank her wonderful caregivers, Yolanda, Angie, Theresa, Maria, Christiana, Lilianna and Siria, as well as her previous caregiver Lillian. Visitation will be held at the DeYoung Shoreline Chapel 7676 Shoreline Dr., Stockton on Wednesday, March 7, 2012 from 11 am to 4 pm. Funeral Services will be held on Thursday, March 8, 2012 at 10:30am at DeYoung Shoreline Chapel. Committal will be private at San Joaquin Catholic Cemetery. In lieu of flowers, the family requests donations be made to the Alzheimer's Association. My thoughts and prayers are with you in this time of sorrow. I hope you find comfort in the fond memories you have of your mom and grandma. We know our mom shared a very special friendship with your mom.We were very happy to have met her. We keep you and your family in our prayers. We have been neighbors with your mother for many years. I enjoyed my visits with Pearl. She is a wonderful person. My thoughts and prayers will always be with her. My dear sweet cousins, How lucky we were all to have known your Mom as we did. I have many many fond memories of her and all of you on many visits to Stockton. She will forever be in my heart. She was a wonderful sweet lady full of fun, joy & grace. I will never forget her garden and how she loved to work out in it. You are all in my thoughts & prayers always. Our thoughts and prayers are with you and your familes. Pearl was a very gracious lady. Life Stories provides friends and families a forum to post their favorite stories and memories of Pearl Moreno ensuring the precious experiences are never forgotten. Share joyful times, post a photo that captures the moments you cherish, and allow others to reply, relive and remember.